Hundreds of Fairfax County homeowners stood in line Tuesday morning to prepay property taxes ahead of the new tax law, which sets a $10,000 cap on property tax deductions beginning Jan. 1, 2018. 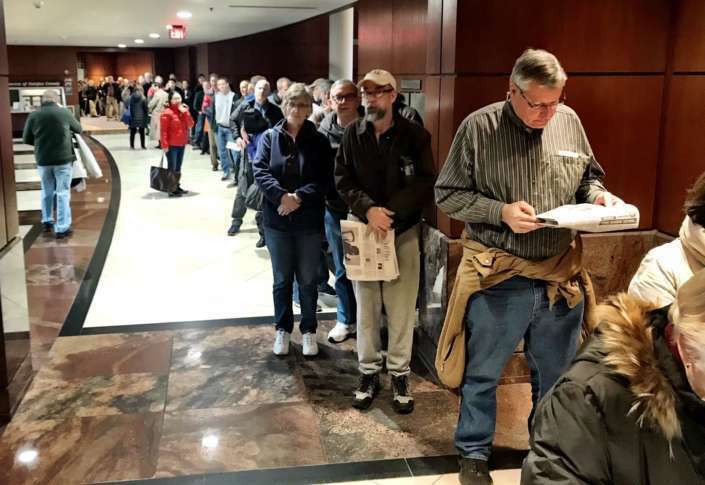 FAIRFAX, Va. — Hundreds of Fairfax County homeowners stood in line Tuesday morning to prepay property taxes ahead of the new tax law, which sets a $10,000 cap on property tax deductions beginning Jan. 1, 2018. Ironically, they could have avoided the hassle. “A lot of people have been here because of some misinformation — I’m not sure what the source is — but some people thought they had to be here to write a check out,” said Scott Sizemore, Fairfax County’s director of revenue collection. Sizemore said the confusion may have been that the county has said it cannot guarantee payments received by mail after Dec. 26 will be processed by the end of the year. Several hundred people stood in line inside the county government building Tuesday morning, looking to pay in person and get a receipt of their payment. A full crew of county tax clerks promptly assisted taxpayers who got to the front of the line. Sizemore said there are several drop boxes inside the building. A taxpayer can avoid standing in line by dropping off the check, and a receipt will be mailed. “If someone wants to write a check, they can bring it here,” said Sizemore. “They need to write their map number or their stub number on their check, write prepay on it, and put it into an envelope,” before placing it in the drop box. Some taxpayers are opting to pay more than one year’s taxes. After the board sets 2018 tax rates, taxpayers who prepay will either get a bill of the amount due or receive a refund. By 10 a.m., most taxpayers in line dropped their checks in the drop boxes, and the long line had evaporated.